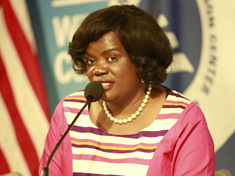 “Women still die…and they die preventable deaths,” said Address Malata, vice chancellor of the Malawi University of Science and Technology, at a recent Wilson Center event honoring the 30th anniversary of the Safe Motherhood Initiative. Malata—a midwife and the former vice president of the International Confederation of Midwives—told the heart-wrenching story of a pregnant woman who, like so many others, died waiting for transportation. Malawi still struggles with retaining an adequate health workforce, especially when it comes to midwives. Malawi needs to increase not only the quantity of midwives that stay in the country, but also the quality of their training and working conditions. “Do they have adequate time to practice when they are going through a midwifery program?” Malata asked. “As an advocate for midwifery, I would like to start protecting the profession,” she said. “There is so much money going to maternal health…but why are women still dying?” she asked, “We are not addressing the core issues that can change women’s lives.” By holding leaders accountable for fulfilling the needs of people on the ground, Malawi can address issues of quality, equity, and dignity for mothers. Address Malata spoke at the Wilson Center on December 8, 2017. Many countries in Sub Saharan Africa are struggling with high maternal mortality rates.Due to this numbers some African countries have introduced free maternity program in order to increase the number of women who seek skilled birth attendance. Although the program has its challenges but it has enabled women to deliver in hospitals.